I used to enjoy booking myself in for an occasional massage or facial, it was always a nice treat, but since Abi died I’ve not been able to allow myself to do it. To relax is to let emotions come to the surface, to be able to meditate on the thoughts going through your mind, to think about how nice the touch is on your skin and enjoy the moment. But you see, when your entire being is held together by invisible ropes of tension attached to a large stone of grief where your heart used to be, encouraging the body to relax is met with quite some resistance. 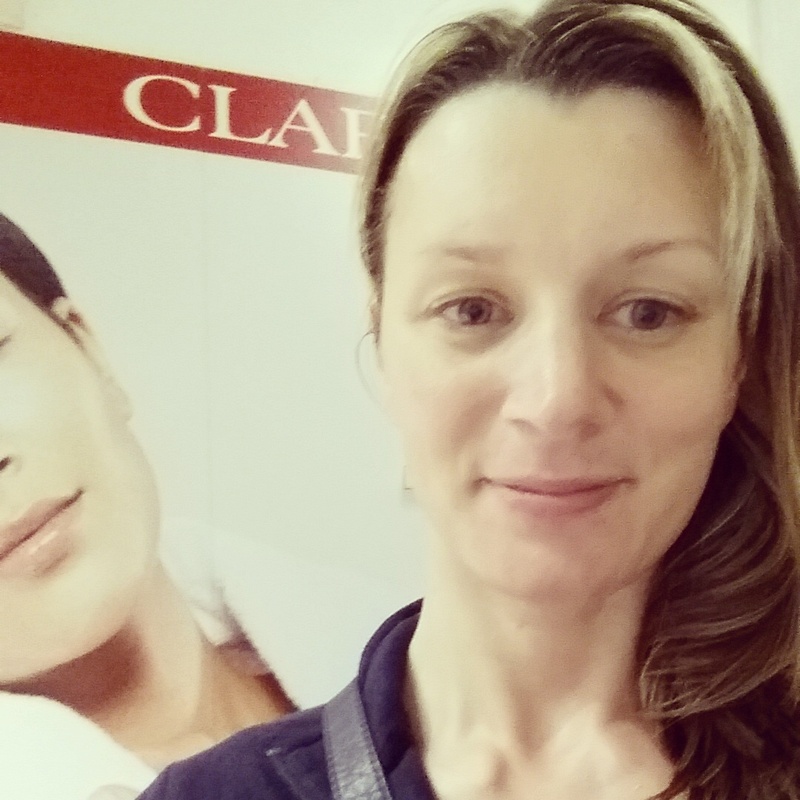 I’d been gifted a facial at our local Clarins treatment room and the idea seemed wonderful. I was so busy thinking of other things after last week’s baptism and birthday celebrations that I sort of forgot why I don’t do relaxing! 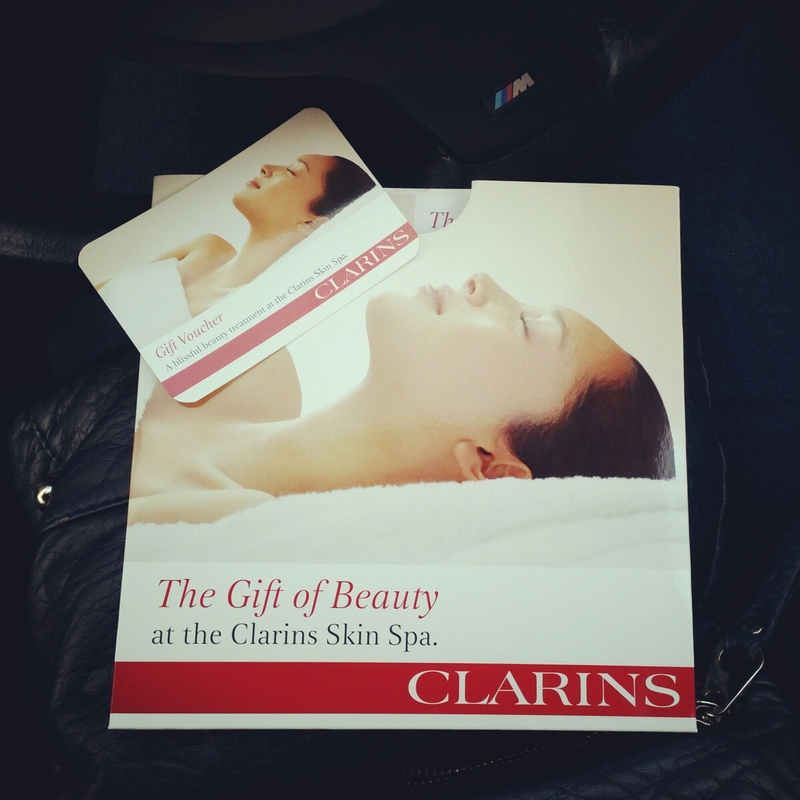 Ooo a lovely Clarins voucher! The therapist was a lovely calm young lady, very softly and slowly spoken – well you would be if you worked in that relaxing environment. I was typically a few minutes late, having rushed away leaving my hubby with the children and negotiated my way through town. But when I walked through the door it was like time was standing still, or everything was in slow motion… I had to suddenly halt my fluster. I lay on the bed, fully clothed but with my shoulders out and my feet bare, and she sweetly asked me about my skin. I noticed I was gabbling away, with nervous anticipation, my laughter seemed out of place, my voice too loud. She smiled slowly and serenely at me. I felt a bit foolish and inexperienced. It was then I realised that she wasn’t going to let me talk my way through this one! I kind of panicked. She turned off all the lights and there was just a faint purple glow to the room. I remember my mind chatter thinking ‘Oh it’s very dark, how can she possibly see what she’s doing’… but no, this was the part where I had to shut up and relax. She began cleansing my skin with oils and creams, ocassionally moving to massage my feet and then my arms. I couldn’t speak as I had all this cream on and she was massaging the life back into my tired and stressed-out face. But seeing as I couldn’t talk to her (which I thought was very professional of her, therapists shouldn’t really encourage a conversation), I was forced to drift into my mind and process the thoughts swirling around – what on earth will we have for tea, that job I need to get done, is there anything I need to pick up , is the baby missing me…. but then my mind turned to darker thoughts. She’d just started to gently rub my shoulders and neck. Deep, tense knots were present on both sides. As I lay in the darkness, I found myself focused on Abi. I first remembered how much she liked this kind of thing – she’d just got into manicures and was taking an interest in pampering. I was reminded of one of our last holidays where I’d bought her a manicure treatment and how much fun we’d had at the beauty parlour. Then I thought how she would be here with me now, if she were alive. 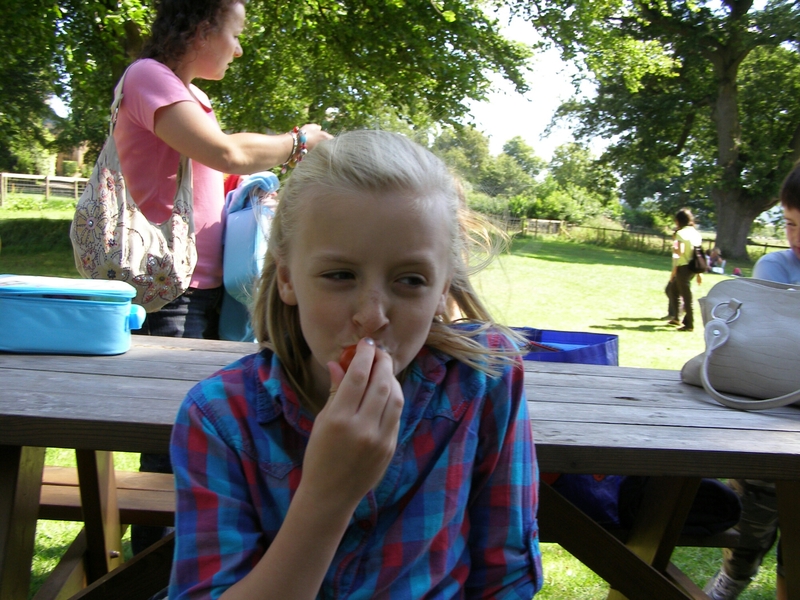 How I’m missing those times with her when we could just be mum and daughter. She’d be interested in what I was having done and would no doubt talk me into getting her a massage too! I’m missing out on all those years of ‘girly’ moments like this. As the therapist massaged my skin, it felt like she was wiping away the layers… the surface emotions, the stress, the anxiety… right down to the lump of hard undissolvable grief. The therapist was asking me to take deep breaths but I could only manage shallow ones as the ball in my chest obstructed the release. I should be snoring in deep relaxation, I was utterly exhausted, but my breath would only go so deep. To get to the core would be to crumble in every way possible. Then I remembered that night. The night she collapsed at home. At around 8.00pm, she suddenly told me she felt unwell; the nausea and giddiness had started, and I told her to go up to bed and rest. Around 8.15pm, my hubby told me to go and see her as he was a bit worried. I went into her room and the light was off. She was propped up in the corner of her bed, in the darkness. It was most unlike her. I thought perhaps the light hurt her eyes. She wasn’t saying much, so I sat and put my arm around her, she said she felt sick (woozy I expect) so I led her to the bathroom. I gave her a sick bowl and left her with my hubby to deal with while I went downstairs to get her some water. I then carried on putting the other two to bed while my hubby dealt with Abi (she was sick)….not long after this, it all happened. After she died, my hubby and I both recalled that terrible memory of her sitting in the darkness, alone, knowing or not how ill she really was, that death was so very close. Back in the treatment room, I held back from sobbing and tried hard to think of something else. As usual, now wasn’t a ‘good time’ to go to pieces. It made me realise why I hadn’t done a massage or facial yet. The closest I’d got was having an osteopathy treatment. The osteopath knows my history, he even treated Abi once, and he presses the point of anxiety every time – naturally, the grief creates tension, which then seizes up the body – the nature of the treatment is fairly brutal so it feels in some way therapeutic and is distracting. I always feel emotional after a treatment as he’s done his best to release the tension that holds my grief together, but it is indeed like a stone that can’t be crumbled. In saying all this, the facial was absolutely divine and reminded me how much I’ve ignored myself this past year. Afterwards, I felt so much more relaxed, almost drunk! My skin did look pretty amazing for a sleep-deprived, hassled mum. So much so, I booked myself another one for a couple of months’ time, but this time, I hope I won’t be caught so off guard. This entry was posted in Life with grief, Living and grieving, My musings about life, Uncategorized and tagged bereavement, family, grief, loss by Chasing Dragonflies. Bookmark the permalink. Your story is inspirational and has helped me deal with my daughters recent passing in June. I’m fortunate that my other daughter is a trained beautician so she helps me relax and I can let all my emotions out in a safe place. Your daughter is so beautiful.